The story of Capcom is in many ways the story of two bygone eras of gaming as a whole. As Nintendo's Virtual Console service has evolved, its strongest supporter has proven to be Capcom. While other third parties have drifted away (either from a lack of interest or a lack of profit), Capcom has made a diligent effort to ensure its rarest and most expensive classics remain accessible through VC: Demon's Crest for Super NES, Mega Man V for Game Boy, Shantae for Game Boy Color, and more. This is, as it should be. Capcom may well be the greatest success story to come from Nintendo's time at the top of the games industry in the '80s. The company's rise to greatness coincided with, and largely came about as a result of, the NES. While its earliest releases — Vulgus and Exed Exes/Savage Bees — didn't exactly stand out in the crowded top-down shooter genre, Capcom quickly set itself apart. In fact, Capcom was born the same year as the NES. Nintendo entered the console market as a major player with the launch of the NES/Famicom in July of 1983, a month after Capcom's founding. Vulgus, Capcom's first arcade title, debuted less than a year later, just as the Famicom began to gain heat in Japan. 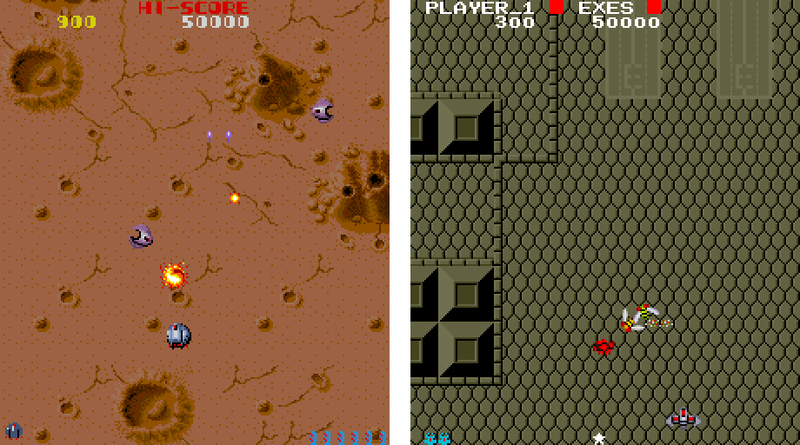 By the end of 1984, Capcom had its first international arcade hit in top-down shooter 1942, created by former Konami designer Yoshiki Okamoto. Unsurprisingly, Capcom chose 1942 to be its first self-published home game. 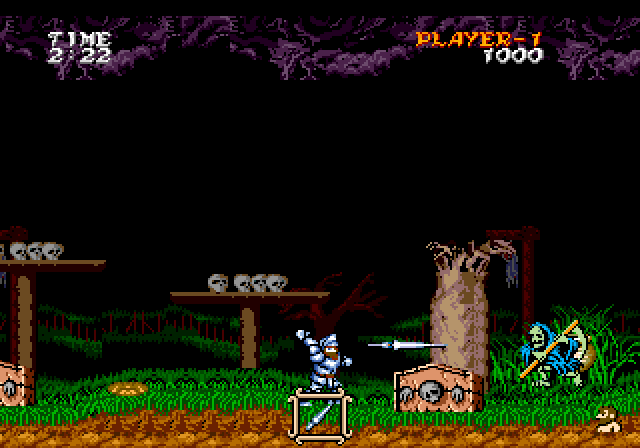 The company licensed out several of its arcade titles for release on home computers in the West — Commando, Ghosts 'N Goblins, Section Z — but those were developed and published by licensees, not by Capcom. For 1942 on Famicom and NES, however, Capcom chose to go it alone. 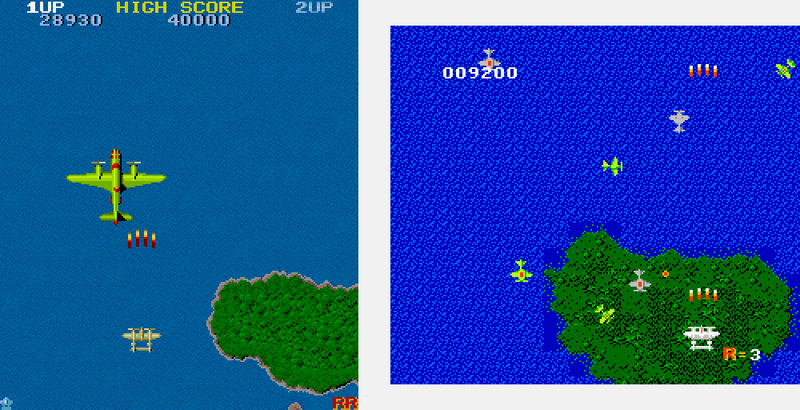 Capcom's awful home conversion of 1942 (arcade left, NES right) wasn't the most auspicious start for its console business. But the company soon found its way. To be honest, it made for a fairly miserable start. 1942 was hardly the most impressive rendition of the arcade hit, with sluggish controls, a stream of irritating noise that could barely be called music, and graphics that flickered erratically despite their simplicity. Capcom's next few home releases weren't much more impressive, either, converting sizzling arcade masterpieces into the console space with a decided lack of style and skill. While some of the blame reputedly rests on the subcontractor who did the programming work on the conversions, ultimately some blame resides with Capcom, who chose to unleash those abysmal renditions upon the world. Still, things began to turn around when the company began doing more of its own internal development for NES. The panache that characterized the company's coin-op releases began to trickle into its console ports, slowly but steadily. Trojan felt far more polished and stable than 1942 and Ghosts 'N Goblins had. Better yet, when it came time to bring Section Z home, Capcom's Famicom team — led by Akira Kitamura — went a step beyond the arcade original. What had begun as a straightforward shooter gained countless hidden secrets, an interesting power-up and life energy system, and a world broken into a labyrinthine series of corridors and passages. It was less a port than a top-to-bottom reinvention, redesigned specifically to fit the needs and routines of home gamers. At this point, Capcom developed both the confidence and resources necessary to share its focus across both an arcade and a home division. Its coin-ops pushed the boundaries of audio and visual design with impressive technology; 1988 saw the debut of the CPS arcade board, which was basically a beefed-up Sega Genesis before there actually was a Sega Genesis. The CPS format gave rise to the company's best known classics, including Strider, Final Fight, and Street Fighter II. The NES version of Section Z didn't look nearly as detailed as the arcade version, but its deeper, more intricate design demonstrated a keen grasp of the different natures of the two game formats. Meanwhile, Mega Man proved that Capcom didn't need to lean on arcade hits to achieve greatness. On the home front, of course, the NES was just settling into international success in 1988. Though the machine had been around for five years in Japan, it had only just begun making inroads in the much larger American market; the 16-bit console era was still more theoretical than practical at that point. So the home division wisely focused on diverging further and further from the Capcom arcade style. After Section Z, Capcom's NES ports never simply duplicated the mechanics and structure of the source material. Instead, they embellished. Some of these reinventions were tremendously successful, as with Bionic Commando; an inventive if uneven (not to mention unfair) four-level action game became a sprawling adventure across a massive map, with a rich inventory system and greatly improved controls. On the other hand, you had games like Strider and Street Fighter 2010, which abandoned the raw action of the arcade in favor of more substantial depth but lacked the polish to pull it off. By no means was Capcom infallible. Strider for NES attempted to create a meaty story-driven adventure out of the arcade game but lacked the technical panache to pull it off... and besides being off-puttingly opaque in design, Street Fighter 2010 had nothing whatever to do with the arcade brawler. Where Capcom truly excelled, however, was in its original creations for NES. After an awkward start with the Japan-only adventure Higemaru Makai-Jima (an odd spinoff of Higemaru), Kitamura and his team developed the company's first truly significant home release: Mega Man. Despite some rough edges, Mega Man featured great platform shooting action — like a faster, less punishing Ghosts 'N Goblins — and a creative power-up system that, combined with its nonlinear level selection system, gave it a remarkable degree of replayability. Around the time that Mega Man's excellent sequel arrived, Capcom began licensing popular American cartoon properties by Disney — an unusual move for a Japanese developer, but a brilliant one. Countless Japanese studios were churning out a seemingly endless stream of games based on anime and manga, and those games were effectively doomed to remain stranded in Japan barring some sort of comprehensive overhaul that removed the license (as with Dragon Ball for Famicom, which began Dragon Power on NES). But Disney's characters and animation had international appeal; even if DuckTales didn't broadcast in Japan every afternoon as it did in America, Japanese gamers still knew Scrooge McDuck and his nephews. Capcom created international hits with its "Disney Afternoon" lineup — and deservedly so, as the craft its home division had developed with its own properties allowed the company to do justice to games like Chip 'N Dale's Rescue Rangers. Contrary to the growing truism that licensed games were inevitably terrible, Capcom's Disney titles ranked among the best the NES had to offer. When the Super NES launched in 1991, Capcom's home and arcade divisions began to converge again. Home hardware had more or less caught up to the CPS system by that point — witness the fantastic and arcade-faithful ports of Ghouls 'N Ghosts and Strider to Genesis — and faithful ports were the theme of the day. Moving into the 16-bit era, Capcom moved away from its tradition of reinvention, producing a few last specimens in the waning days of the NES before refocusing on making its home conversions as faithful as possible. Street Fighter II became gaming's gold standard throughout much of the 16-bit era: Eagerly sought, openly imitated, and capable of giving a licensor a significant upper hand. This convergence didn't devalue Capcom's console work. If anything, it liberated it. The company begin to extend its reach beyond Nintendo's machines, publishing software for mainstream machines like the Genesis and TurboGrafx-16 as well as more obscure devices like the FM Towns and Sharp X68000. And it began to dig more deeply into genres beyond pure action; while Capcom had experimented with RPGs and horror games in the Famicom era (with Destiny of an Emperor and Sweet Home, respectively), it made far more respectable efforts in the 16-bit era. Capcom got its start on Nintendo's NES, but with the arrival of the 16-bit era the publisher spread its wings to other systems and became a true industry leader. Of course, Capcom's breakout in the early '90s came in the form of Street Fighter II, which didn't simply reinvigorate its arcade business — it reinvigorated arcades, period. Street Fighter II and its semi-sequels became a sort of holy grail for consoles in a way that seems unthinkable now. Today, when games are more likely to strain at the limits of budgets and manpower than they are the potential of the hardware itself, there's nothing like a Street Fighter II to serve as a focal point for console wars. 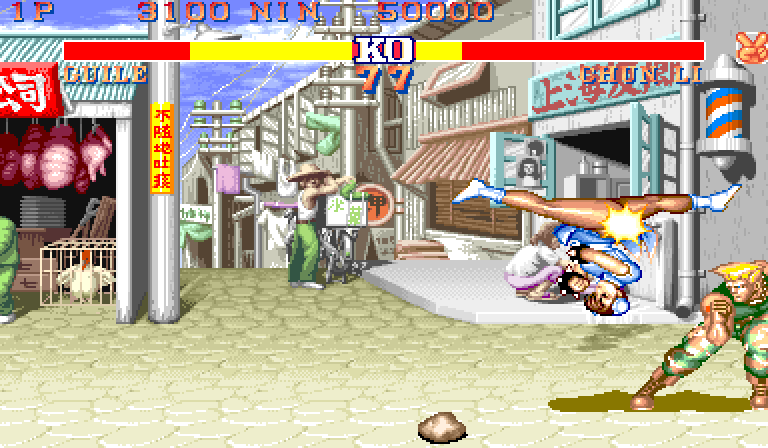 But in the 16-bit era, a console's adaptation of Street Fighter II meant everything. Super NES could well have remained a distant second to Genesis if not for its exclusive one-year lock on Street Fighter II. Many Famicom and NES developers lost their way during the 16-bit era, but Capcom only grew more focused, more confident. It followed Mega Man 5 with the vastly more intricate Mega Man X; it gave us the Breath of Fire games, with visuals more dynamic than Final Fantasy and a hint of action RPG through the overworld interactivity its heroes' skills enabled; it refined the belt scrolling brawler; it codified the fighting genre. Capcom wasn't without its stumbles; not every creation it produced was a hit. And by many accounts, the company was one of those hit hardest when the 16-bit market went soft in the mid '90s, having overproduced some very expensive cartridge-based Super NES and Genesis games that never sold. But even these setbacks didn't keep the company from maintaining its excellence — perhaps even growing it! — during the 32-bit era. Capcom grew up alongside the console games industry, despite its arcade roots, and in many ways its catalog offers a perfect picture of each moment in that time.